The Women's International League for Peace and Freedom (W.I.L.P.F. )was founded in 1915 at The Hague by women active in the suffrage movements in Europe and America who wished to end the First World War and to insure that no further wars occurred. The League began its work in Canada in 1920 in Vancouver, led by Dorothy Steeves and Laura Jamieson, with Lucy Woodsworth, Agnes McPhail and Violet McNaughton among its members. The League's work has been to promote peace education and to campaign for disarmament and anti-militarism. During World War II it opposed the introduction of military cadet training in schools and it has investigated textbooks which glorified war. In 2001, the Vancouver branch joined with the Toronto branch to start a Canadian section. 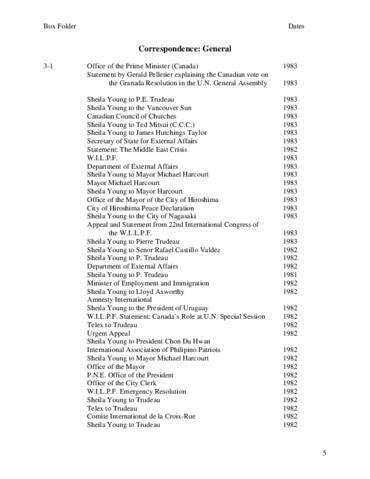 The fonds consists of correspondence, much of it by or addressed to Sheila Young, concerning various international issues. Among the addressees are Prime Ministers Trudeau, Pearson, and Diefenbaker; various cabinet ministers; international heads-of-state; the United Nations; newspapers, commissions and organizations; government departments and agencies, and businesses. The fonds includes records of the 11th, 13th-18th, and 20th International Congresses of the W.I.L.P.F., as well as printed material on military expenditures, the atomic bombings of Hiroshima and Nagasaki, peace, and the polar regions, and also contains evidential records pertaining to W.I.L.P.F. operations. An accrual was added in 2007 containing printed material, minutes, correspondence from 1988-1997, financial and other operations records, ephemera, and records relating to the creation of the Canadian section and the drafting of its constitution. An additional accrual was added in 2015 including video recordings of W.I.L.P.F. and affiliated organizations events, and other organizational records. PDF file contains a complete list of W.I.L.P.F. correspondence in box 3. Two accruals have been added, the first in 2007 and a second in 2015. These accruals contain printed material, minutes, correspondence from 1988-2012, financial and other operations records, ephemera, records relating to the creation of the Canadian section and the drafting of its constitution, and video recordings of W.I.L.P.F. and affiliated organization events. Boxes 1-8 of fonds entered into online database, and boxes 9, 10, and 11 processed, arranged, described and entered into online database by student archivist Dennis Michailides during the month of November 2015.